Forbe's yellow-fronted parakeet is also known as the Chatham Island yellow-crowned parakeet. It is a medium-sized parakeet with a long tail, bright green plumage, a yellow crown, and a red frontal band. Adults reach up to ten inches. Once considered an individual species, this parakeet was designated a subspecies of the yellow-crowned parakeet in 1930. These parakeets prefer dense unbroken forest and scrub for their habitat. They have also been observed in more open habitats such as grasslands, and they are also known to survive in non-forest habitats when food is scarce in the forest. Diet consists mainly of invertebrates, leaves, flowers, and seeds. Forbe's yellow-fronted parakeets prefer to remain alone or in pairs, and flocks have rarely been observed. Nesting pairs have been observed remaining together throughout the year, defending their territories, and building nests in tree holes. Breeding occurs from October to March. Five to nine eggs are laid, and they hatch 20 days later. Forbe's yellow-fronted parakeet is one of the rarest parakeet species in New Zealand and is endemic to Mangere and Little Mangere Island in the Chatham Islands. It is seriously endangered because of hybridization with red-crowned parakeets, loss of habitat due to forest clearance, and predation by introduced cats. Yellow-crowned parakeets are forest birds and rely on forest preservation for survival. 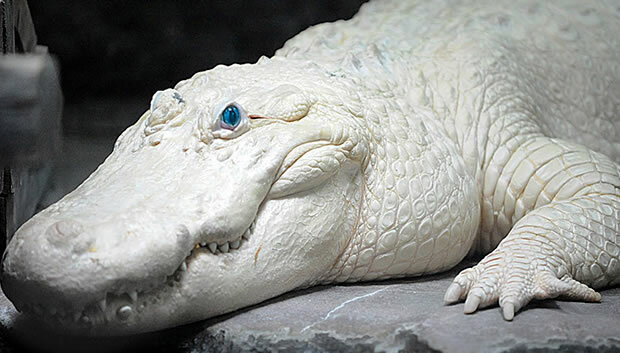 Some are bred and do well in captivity. 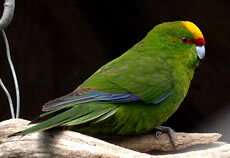 Conservation plans include the restoration and legal protection of forests in the Chatham Islands, and later reintroducing some captive birds into the wild. Copyright Notice: This article is licensed under the GNU Free Documentation License. It uses material from the Wikipedia article "Yellow-crowned parakeet". Glenn, C. R. 2006. "Earth's Endangered Creatures - Yellow-crowned Parakeet Facts" (Online). Accessed 4/20/2019 at http://earthsendangered.com/profile.asp?sp=324&ID=4. Need more Yellow-crowned Parakeet facts?